Yescom 1-Person Folding Tent Cot is a new item on the market, easy to use and very comfortable for off-ground sleeping regardless of where you use it. With mesh windows and doors on all sides, it provides lots of ventilation. Yescom 1-Person Folding Tent Cot. Ozark Trail One-Person Cot Tent is an incredibly affordable collapsible sleeping system with a huge bed and a two-layer tent attached to it. Ozark Trail One-Person Cot Tent with the fly on. 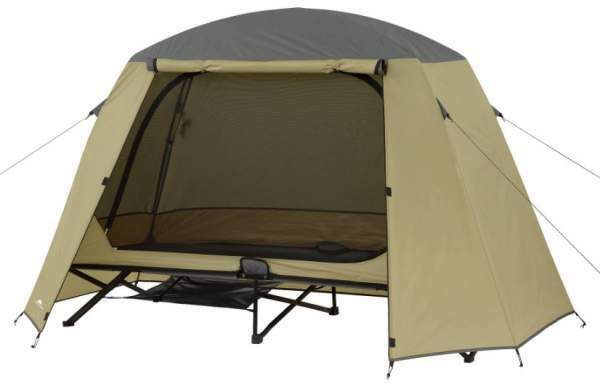 Ozark Trail Realtree AP Instant Tent Cot is a very reliable item with an incredibly easy setup, with two doors and several mesh windows, and with a very affordable price tag. Ozark Trail Realtree AP Instant Tent Cot. The Tangkula Tent Cot is a nicely built outdoor sleeping system with a really affordable price, and it offers a full protection from elements. Tangkula Tent Cot – folding and waterproof 1 person camping tool.